“I am most impressed by Murason Business Services’ friendliness and responsiveness. I would go so far as to say that you set the benchmark in service delivery that other companies can learn a lot from”. – Thabile Wonci, Managing Director, Kogae Rainbow Investments ( Pty) Ltd. The Legend Of The “One Man Army” Entrepreneur. By guest writer Nelson Sebati, Entrepreneur and Non-Executive Chairman at Murason Business Services. He has 10 years’ experience in recruitment, talent acquisition, career transitioning & on-boarding, with a specific focus on IT and Executive skills. He is a certified Career Strategist and Job Search Coach. He studied Entrepreneurship at Wits Business School, Law at UNISA, BBBEE at SBL among other numerous qualifications& is currently a member of the YBSA, BMF, REC-UK, APSO, CSSA, ASA, and IoDSA. Entrepreneurship is not an exact science. It probably is the furthest thing from it. However most people mistake Entrepreneurship with the famed legend of the “One Man Army”, but in life as in the picture above if you tilt your head or your screen a tab bit you will see the supporting troops in the background. 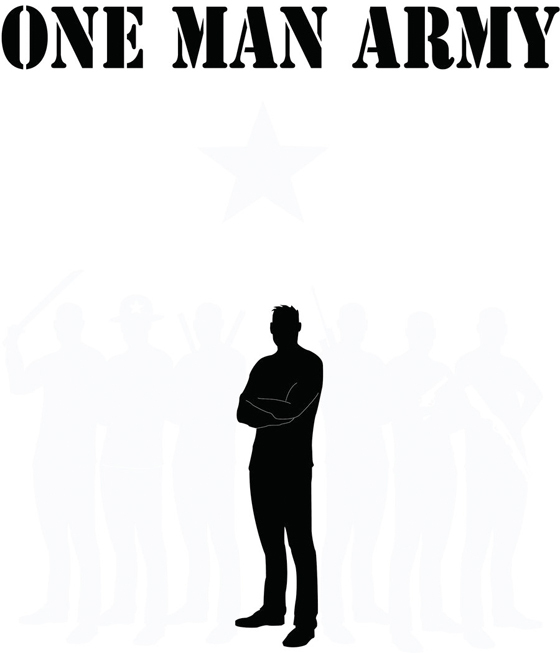 Though fabled and celebrated the “One Man Army” approach is completely wide of the mark. According to this approach the Entrepreneur controls everything and gives limited responsibility to others. I think if Entrepreneurs are to run successful businesses then they must learn to trust others and share responsibility with them. Team effort plays a major role in the development and growth of a business. So by delegating out tasks to others Entrepreneurs not only reduce their workload, but also give opportunities to others to show their talents. By encouraging teamwork and cooperation the Entrepreneur transforms from a “One Man Army to a 5-Star-General and this is usually accompanied by better service delivery, increased customer satisfaction and higher staff morale. Most importantly it allows the Entrepreneur to do his/her job of creating much better. Legal Team – Providing internal legal expertise. We are dedicated to employing, empowering and developing people with the competencies required to enhance their careers. We constantly seek employees who wish to become instrumental participants in sustaining the company’s competitive advantage. We value and reward the efforts of our staff because coming together is a Beginning, keeping together is Progress, working together is Success and staying together is significance. We are a young company with many adventures and victories ahead of us. For the latest news on our journey follow us on Twitter, connect with us on LinkedIn and like our page on Facebook. Murason Business Services is a pioneering Professional Services and Government Solutions company with a singular focus on delivering viable, sustainable, high-value and well-planned services and solutions that are uniquely South African. Our business model is simple, flexible and transparent. It centres on building mutually beneficial business partnerships with major players in the Private and Public sector. © 2019 Murason - All rights reserved.